And it appears that having “the tender sweetness of a seasick crocodile” is not a good strategy for big budget increases. Indeed, it appears that working as an adjunct of the Obama reelection campaign has backfired on the IRS. One of the good results of the “cromnibus” negotiations is that GOPers actually took revenge on the IRS for political interference. The bureaucracy is actually going to get less money next year. In other words, a real budget cut, not one of those fake Washington cuts that occur when spending doesn’t increase as fast as desired. Not surprisingly, the big Democratic donor who now serves as IRS Commissioner isn’t very happy about this development. The Hill reports that the John Koskinen is claiming that his agency’s budget has been cut too much…and he’s saying that the bureaucrats will make taxpayers suffer as a result. And here are some passages from a story published by Fox News. The Internal Revenue Service is crying poor in the face of budget cuts and weighing the possibility of its own short-term shutdown — even warning that tax refunds could be delayed next year. …”Everybody’s return will get processed,” Koskinen told reporters. “But people have gotten very used to being able to file their return and quickly getting a refund. This year we may not have the resources, the people to provide refunds as quickly as we have in the past.” …Congress cut the IRS budget by $346 million for the budget year that ends in September 2015. The $10.9 billion budget is $1.2 billion less than the agency received in 2010. The agency has come under heavy fire from congressional Republicans for its now-halted practice of applying extra scrutiny to conservative groups seeking tax-exempt status. So what’s the real story? Is the IRS budget not inadequate? Do the bureaucrats need more spending to process refund checks? Well, my first response is to scold people who get refunds. That means, after all, that they overpaid their taxes during the year and – for all intents and purposes – gave the government and interest-free loan. But that’s a separate issue. Let’s focus on the IRS budget. 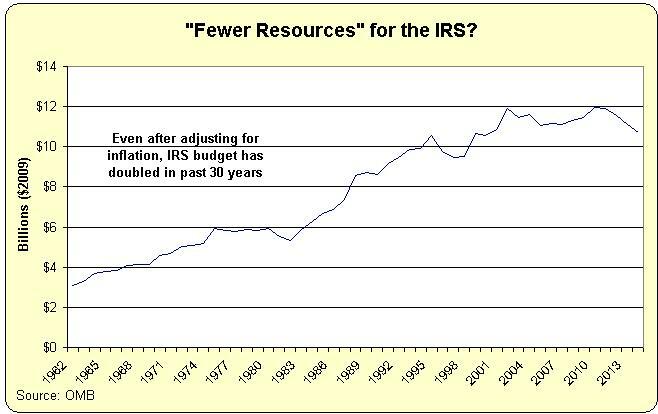 And as you can see from this chart, the IRS budget has declined since 2010. But you can also see that the IRS budget has approximately doubled over the past thirty years. And these numbers are adjusted for inflation! So feel free to cry tears for the IRS, but just make sure they’re crocodile tears. Just like the ones we all cried when the IRS complained about the possibility of being covered by Obamacare, even as the bureaucrats doubtlessly were looking forward to the new power the IRS got as a result of the law (and as humorously illustrated by cartoons from Gary Varvel, Glenn McCoy, and Henry Payne). Now let’s bend over backwards and look at the issue from the IRS’s perspective. The bureaucrats will argue with some validity that tax laws are far more complex today than they were thirty years ago. That’s unquestionably true, as shown by data on the number of pages in the tax code, number of provisions in the tax law, and even by the number of pages in the instruction booklet for the IRS 1040 form. Heck, I mentioned just a few days ago that there were more than 4,600 changes in the tax code between 2001 and 2012 alone. And think of awful tax laws like FATCA that cost more to enforce than they produce in revenue. All this nonsense is mostly the result of bad laws imposed by politicians, not a result of IRS actions. But I still can’t find it in my heart to feel sympathy for the IRS. After all, the IRS somehow managed to find the staff and resources to launch a politically motivated attack against tea party groups. And the so-called Taxpayer Advocate takes the side of the IRS rather than taxpayers. Worst of all, the bureaucracy even found enough money to hand out bonuses after being caught trying to interfere with elections! 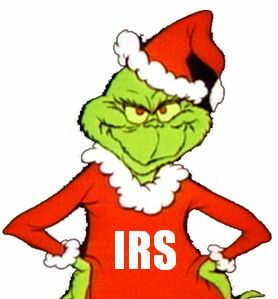 So let’s celebrate the fact that the IRS is being subjected to some modest but long-overdue belt-tightening. It couldn’t happen to a nicer group of people. The bottom line is that IRS budget cuts show that Republicans sometimes do the right thing.